The Cow Cast Iron Bank is a great decorative bank that's ready for your rainy day fund. The black and white dairy cow will add charm to any room. 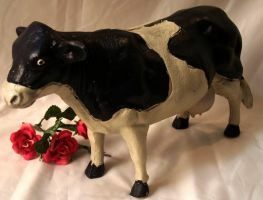 This is the perfect gift for any cow lover, dairy enthusiast, piggy-bank collector, or person saving up for a rainy day. Great for all ages.